A hit-and-run accident involving four vehicles in Fairfield ended in the arrest of a woman who was found hiding in a neighboring town. The woman, who has since been released from the Fairfield Police Department on unsecured bail, was a transient driving without a license at the time of the crash. Melinda Caven, 31, was charged with driving without a license, leaving the scene of an accident and attaching false plates to a vehicle. She also received a felony charge regarding the theft of a license plate. The accident involved four vehicles, including the one Caven was driving. There were no injuries reported in that incident. After fleeing the scene of that crash, Caven struck a house, causing significant property damage. She also fled that collision, driving away with a flat tire. She abandoned the damaged vehicle near an auto parts store in Waterville. Police found her hiding behind the building. The accidents occurred on the morning of November 10 on Main Street in Fairfield, near the Village Market. Caven’s Chevy Cavalier rear-ended a Honda that was stopped in a work zone. The impact of that collision resulted in a chain reaction involving two more cars, a Buick and a Dodge. Caven then drove her Cavalier to Burill Street, where she lost control of her car and crashed into the corner of a house. Caven then made her way to Drummond Street in Waterville, where officials from Fairfield, Waterville and Winslow located her and made the arrest. At the time of the arrest, a member of Waterville’s law enforcement recognized the license plates on Caven’s vehicles as plates that had been reported stolen the day before. According to Maine’s Department of Transportation, a reportable traffic accident occurs every 18 minutes in the state. A total of 28,896 crashes occurred on public roads in the state in 2013, with 30 percent of those crashes occurring between 2:00 p.m. and 6:00 p.m. Rear-end collisions were the most frequent, occurring in approximately one-third of all accidents reported. Road deaths in the state have been declining over the past 70 years, according to a report from the Bangor Daily News at the beginning of this year. Officials attribute the decline in part to better education of highway safety issues and an 85-percent rate of seatbelt usage. However, accidents involving personal injuries and property damage continue to be a concern for the state. Under Maine law, parties involved in any crash in the state must exchange vehicle and license information. When personal injuries or significant property damage ($1,000 or more) occur, law enforcement must also be called to the scene. Drivers involved in the collision must also remain at the scene until law enforcement arrives. The Maine State Bar Association recommends getting professional legal help when you are the victim of a traffic accident. The type of attorney hired will depend in part on the type of accident and whether there was property damage or personal injury involved. Hardy, Wolf & Downing are leading Maine car accident lawyers serving Portland, Lewiston, Bangor and Auburn. 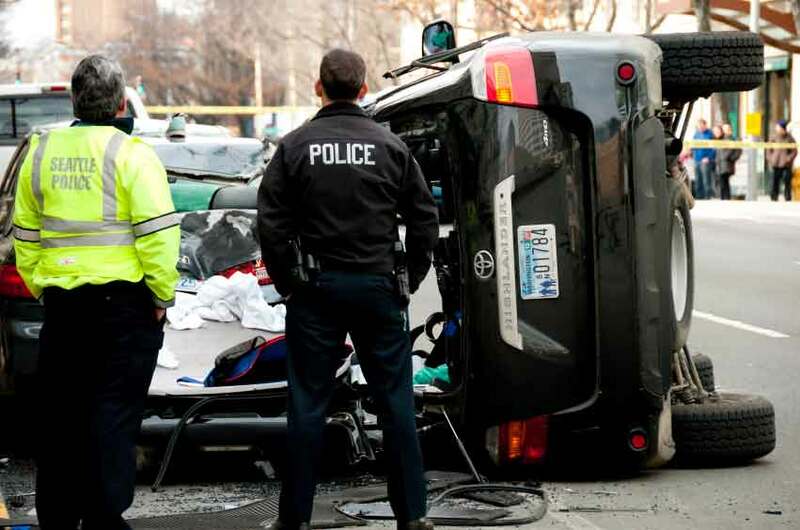 To learn more about your legal rights following a traffic accident, call 1-800-INJURED for a free case review.